Because Kris is adorable like that. Listen to Kris Allen’s new single The Vision of Love here! Kris said the new single would be announced on March 4, but RCA Records broke the news today and tweeted that the new single is The Vision of Love and TRIPLE YAY because I love that song! It’s already been played on a couple of radio stations and you can listen to it in the video embedded below. 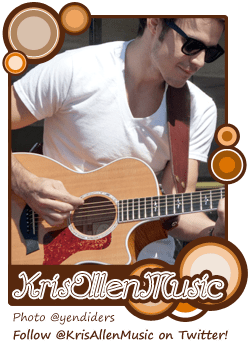 15 questions with Kris Allen! Kris shows off his dance moves! Read the full article for info on the upcoming single. WE NEED NEW MUSIC FROM YOU NOW, KRIS!